Widget #1988 is now at the Bridget. 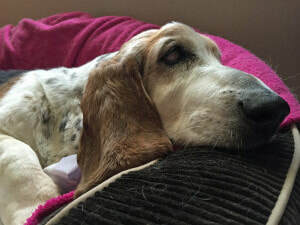 This sweet senior hound had a very rough life before coming to BBR but she was very loved by her foster mom and then found a wonderful forever family. 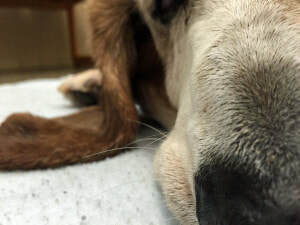 “We spent the night cuddling on her favorite red blanket that her foster mom Erica sent along with her. In the morning I knew it was her time, she was tired. We just had one last drive to make…McDonalds! Widget had a cheeseburger and an ice cream cone all to herself. She really enjoyed it!